The 405 TS Microplate Washer features the new patented* Verify™ technology, which runs an automated QC check for manifold tube blockage, and visually reports any failed wells. The patented Ultrasonic Advantage™ can then be used to automatically and thoroughly clean the aspirate and dispense manifolds. The 405 TS, with the unique Verify and Ultrasonic Advantage features, overcomes the common problem of undetected washer manifold clogging which can lead to assay failure. 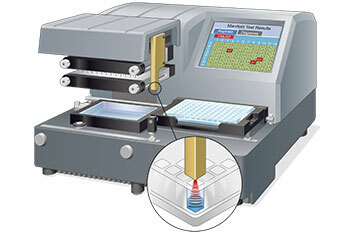 The 405 TS is the first self-checking, self-maintaining microplate washer available! The 405™ Touch Microplate Washer incorporates a high resolution touch screen user interface for intuitive and flexible programming of 96- and 384-well microplate wash protocols. The extensive onboard software seamlessly guides users through protocol development, instrument maintenance and operation. For those who prefer computer control or require 21 CFR Part 11 compliance, the 405 TS can be controlled with optional LHC™ Software. Cell-based assays and microsphere-based assays are easily run with the 405 TS' unique set of available features and modules for gentle washing vacuum filtration and biomagnetic separation. The 405 TS is Luminex® xMAP® approved; a range of configurations is available for this and a broad variety of other microplate washing applications. Review the models and specifications sections for details on all the possible configurations, there’s certain to be one that fits your laboratory’s requirements. Patented built-in Verify sensor automatically checks dispense / aspirate performance and reports clogged locations in the color graphical display. Additional software flexibility and 21 CFR Part 11 compliance with Liquid Handling Control™ (LHC) Software for method development, downloading and washing plates.